Critical Links is focused on providing innovative IT solutions for common problems faced by schools and companies around the world. Our global expertise in information technology allows us to provide smart solutions that have a real and positive impact. Critical Links was started in 2006 as a division of the Critical Group, an international software group with activities in Aerospace, Energy, Health-Care and Telecom, and offices in the USA, UK, Portugal, Germany, Brazil, Singapore, and Angola. The group is anchored by Critical Software, and has built a solid reputation for the development of mission-critical systems, and serving demanding customers such as the Nasa JPL and the European Space Agency. With a seasoned team in all aspects of product development, marketing and support, our portfolio clearly reflects our drive to create solutions with a global and meaningful reach. 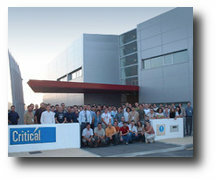 Critical Links is headquartered in Princeton, New Jersey, U.S.A, and has its engineering development and support center in Coimbra, Portugal.